Shares bounced between sharp losses and big gains as the company went through a major shift in business models. 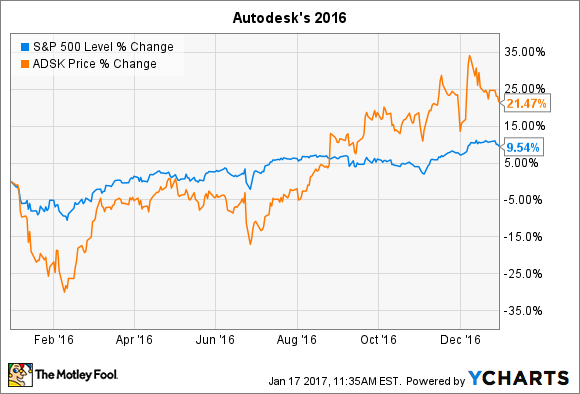 Computer-aided drawing specialist Autodesk (NASDAQ:ADSK) gained 21% last year, according to data provided by S&P Global Market Intelligence. The rally trounced broader market returns but was notable for its extreme volatility. Autodesk at one point in the year was down by over 25% and at one point had gained as much as 35%. The big price decline early in the year coincided with a major disruption in the software maker's business model. Its shift away from upfront product sales and toward subscription-based selling generated a decline in revenue for its fiscal fourth quarter and pushed Autodesk into a net loss. Those trends only accelerated in the following quarter, where revenue plunged by 21% and earnings dove to a $173 million loss from a $19 million gain in the prior-year period. Throughout this time, management pointed to strong subscription numbers as evidence of solid operating strength, but investors instead chose to focus on the weakening top and bottom lines. Wall Street changed its mind after Autodesk's next two quarterly earnings announcements trounced consensus estimates. Its most recent result in late November, its first under an entirely subscription-based model, showed solid subscriber growth. "We experienced robust demand in the third quarter building on the momentum of a very strong second quarter," Chief Financial Officer Scott Herren told investors at the time. With the transition still temporarily pressuring sales and profit figures, investors should watch Autodesk's subscription growth relative to management's forecast. The company believes it can add about 525,000 paying users in 2017. Beyond that, subscriber gains should run at a 20% compound annual growth rate through fiscal 2020. Investors are hoping that the recurring revenue stream will make the business less volatile as it marches back toward profitability and puts last year's painful business-model shift behind it.